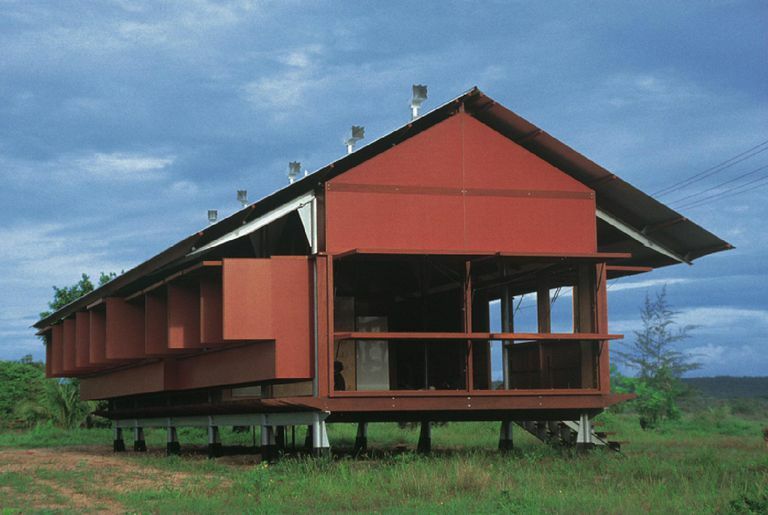 The Marika-Alderton House, completed in 1994, is located in the Yirrkala Community, Eastern Amheim Land, in the Northern Territory of Australia. It is the work of London-born Australian-based architect Glenn Murcutt. Before Murcutt became a Pritzker Laureate in 2002, he spent decades formulating a new design for the elite Australian homeowner. Combining the simple shelter of an Aboriginal hut with the Western traditions of the outback house, Murcutt created a prefabricated, tin-roofed frontier home that adapted to its environment instead of forcing the landscape to change — a model of sustainable design. It's a home that has been studied for its elegant simplicity and ecodesign — good reasons to take a short tour of the architecture. Murcutt's sketch from 1990 shows that early on the architect was designing the Marika-Alderton House for the near sea level site. North was the warm, wet Arafura Sea and the Gulf of Carpentaria. The south held the dry, winter winds. The house should be narrow enough and with adequate vents to experience both environments, whichever dominated. He tracked the movement of the sun and designed wide eaves to shelter the house from what he knew would be intense radiation just 12-1/2 degrees south of the Equator. Murcutt knew about differential air pressure from the work of Italian physicist Giovanni Battista Venturi (1746–1822), and, so, equalizers were designed for the roof. Pivoting tubes along the roof expel hot air and vertical fins direct cooling breezes into the living spaces. Because the structure rests on stilts, air circulates underneath and helps cool the floor. Elevating the house also helps keep the living space safe from tidal surges. Built for Aboriginal artist Marmburra Wananumba Banduk Marika and her partner Mark Alderton, the Marika-Alderton House ingeniously adapts to the hot, tropical climate of Australia's Northern Territory. The Marika-Alderton House is open to fresh air, yet insulated from intense heat and protected from strong cyclone winds. Opening and closing like a plant, the house embodies architect Glenn Murcutt's concept of a flexible shelter that exists in harmony with nature's rhythms. A quick pencil sketch became a reality. There are no glass windows in the Marika-Alderton House. Instead, architect Glenn Murcutt used plywood walls, tallow-wood shutters, and corrugated iron roofing. These simple materials, easily assembled from prefabricated units, helped contain construction costs. One room fills the width of the house, enabling cross-ventilation breezes in the hot climate of northern Australia. Tilting plywood panels can be raised and lowered like awnings. The floor plan is simple. Five bedrooms along the south part of the house are accessed from a long hallway along the north, seaside view at the Marika-Alderton House. The simplicity of design allowed the home to be prefabricated near Sydney. All of the parts were cut, labeled, and packed into two shipping containers that were then transported to Murcutt's remote location to be assembled. Laborers bolted and screwed the building together in about four months. Prefabricated construction is nothing new to Australia. 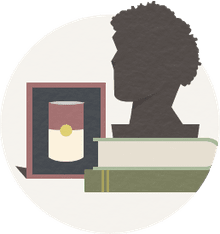 After gold was discovered in the mid-19th century, container-like shelters known as portable iron houses were prepackaged in England and shipped to the Australian outback. In the 19th and 20th centuries, after the invention of cast iron, more elegant homes would be cast in England and shipped in containers to the British Commonwealth. Murcutt knew this history, no doubt, and built upon this tradition. Looking similar to a 19th century iron house, the design took Murcutt four years. Like the prefabricated buildings of the the past, the construction took four months. Slatted shutters allow the occupants of this Australian residence to adjust the flow of sunlight and breezes into the interior spaces. The entire north side of this tropical home overlooks the beauty of the sea — salt waters constantly warmed by the Equatorial sun. Designing for the Southern Hemisphere shakes traditional notions from the heads of Western architects — follow the sun in the north, when you're in Australia. Perhaps this is why so many professional architects from around the world travel to Australia to attend a Glenn Murcutt International Architecture Master Class. "Built about an elegant structural steel frame finished in aluminum, and fitted with equally elegant aluminum roof vents so as to discharge the build-up of air pressure under cyclonic conditions, it is all together more cubistic and substantial than his earlier architecture," writes Professor Kenneth Frampton about Murcutt's design. Despite the shrewdness of its architecture, the Marika-Alderton House also has been hotly criticized. Some scholars say that the house is insensitive to the history and political plight of the native culture. The Aborigines have never constructed stationary, permanent structures. Moreover, the project was partially funded by a steel mining company that used the publicity to enhance its corporate image while negotiating with the Aborigines over mining rights. Those who love the house, however, argue that Glenn Murcutt combined his own creative vision with Aboriginal ideas, creating a unique and valuable bridge between cultures. Can Feng Shui Change the Way You Live?